Stoyo Shishkov was born in 1865 in the village of Ustovo near the town of Smolyan. He was a pedagogue, man of letters, ethnographer. Lived in Plovdiv since 1904 as a teacher. He was the initiator of starting the collection of a Regional Museum of Ethnography in Plovdiv. He dedicated his life to collecting documents of cultural and political history of the region. 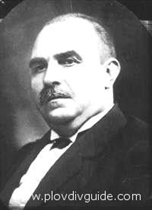 He was the author of the following research papers: Ethnographic and Historical Importance of the Monasteries of the Plovdiv Diocese (1922), Plovdiv in Past and Present (1926), The Role of Plovdiv and its Diocese in the Fight for Church Independence and the National Revival (1930), Importance and Development of Girls Education in Plovdiv (1930).